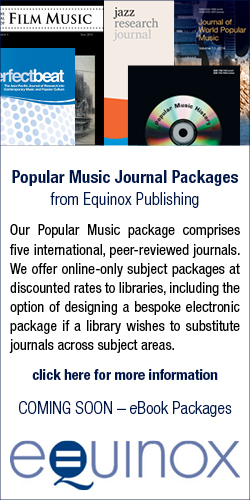 Journal of World Popular Music is a peer-reviewed academic journal that publishes research and scholarship on recent issues and debates surrounding international popular musics, also known as World Music, Global Pop, World Beat or, more recently, World Music 2.0. The journal provides a forum to explore the manifestations and impacts of post-globalizing trends, processes, and dynamics surrounding these musics today. It adopts an open-minded perspective, including in its scope any local popularized musics of the world, commercially available music of non-Western origin, musics of ethnic minorities, and contemporary fusions or collaborations with local ‘traditional’ or ‘roots’ musics with Western pop and rock musics. Placing specific emphasis on contemporary, interdisciplinary, and international perspectives, the journal’s special features include empirical research and scholarship into the global creative and music industries, the participants of World Music, the musics themselves and their representations in all media forms today, among other relevant themes and issues; alongside explorations of recent ideas and perspectives from popular music, ethnomusicology, anthropology, musicology, communication, media and cultural studies, sociology, geography, art and museum studies, and other fields with a scholarly focus on World Music. The journal also features special, guest-edited issues that bring together contributions under a unifying theme or geographical area. Alongside regular articles that focus on the study of World Music in all its forms and from a variety of academic and other perspectives, the journal also features alternative means of representing research and scholarship through creative and visual means such as photography, poetry and artwork, and audio and video means through an accompanying website. The journal also includes reviews of relevant books, special issues, magazines, CDs, websites, DVDs, online music releases, exhibitions, artwork, radio programs and world music festivals.